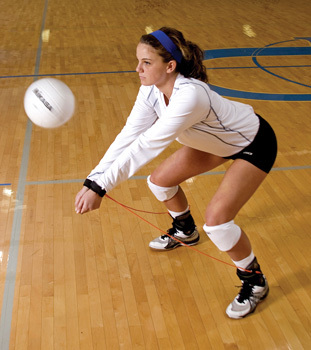 The Pass Rite is an easy to use training tool that utilizes a durable elastic band that attaches to the passer's wrists and ankles preventing excessive upward arm movement. The small, lightweight Velcro wrist cuffs were designed to minimize ball contact interference. The elastic band is adjustable to accommodate any passer's height.